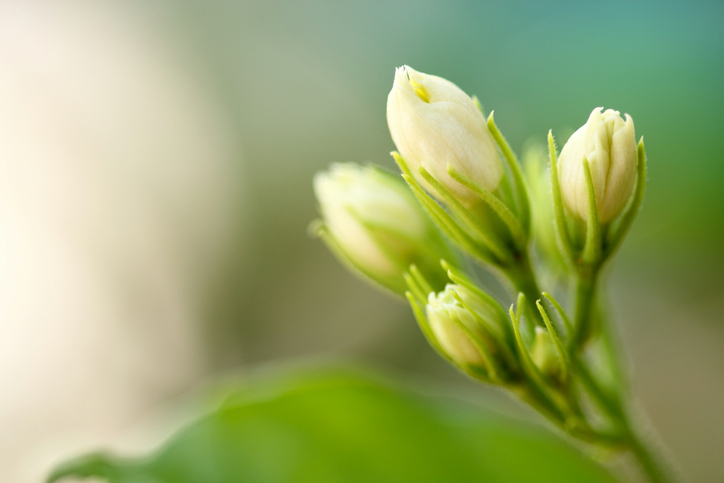 A bud is the small part on the end of a plant from which leaves or flowers grow. In some organisms, a bud is a prominence that develops into a new individual, and in general, any round small rounded part on a body can be called a bud, especially the rounded protuberances from which horns sprout. Figuratively, an immature or undeveloped person or thing is also a bud. As a verb, to bud means ‘to produce buds’ or ‘to begin to develop.’ Unrelatedly, bud is a slang term for “friend;” it comes from the word buddy. Buds began to appear on the trees in early spring. Jellyfish polyps produce buds that grow into adult jellyfish. The young male deer did not yet have antlers, but you could see the buds on his head. The first buds of Tom's ambition began to develop in his teenage years. The rosebush has begun to bud. It was clear that civil unrest was budding and that the government needed to take action to avoid it. Hey bud, do you want to grab a beer? In Scottish English, bud was also a word for bribe, but this meaning is now archaic. Bud dates back to the late 14th century. The Middle English noun budde (meaning bud, spray or pod) is of unknown origin. Some linguists think it came into English through the Old French boter (to push forward or thrust), which is Germanic in origin. Others believe it came from a figurative use of the Old English noun budd (beetle). Either way, all agree that the origin, though lost, is Germanic. It is related to the Old Saxon budil (bag or purse), the Old Norse budda (purse), the dialectal Swedish bodd (head), the Middle Low German buddich (swollen), the Dutch buidel (bag or purse) and bot (bud), and the German Beutel (bag or pouch) and Hagebutte (hip, on a plant). The verb comes from the noun, and dates back to around the year 1400. The colloquial expression bud, short for buddy, dates back to the mid-19th century. It is thought to be either an alteration of brother or a variant of the English slang butty (companion).